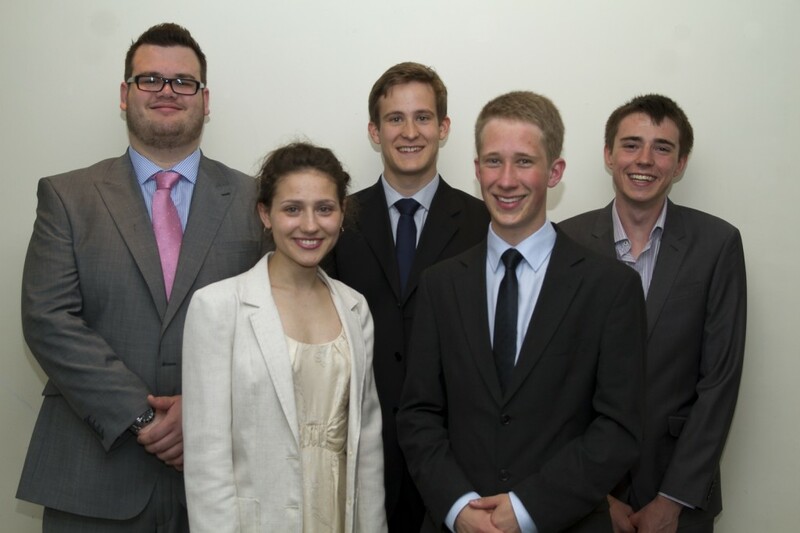 Outstanding students recognised in music awards ceremony | Music Matters | Because it does. Doesn't it ? 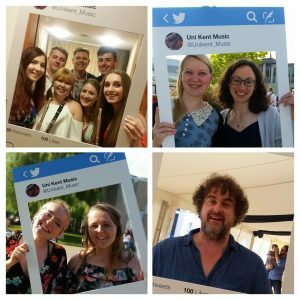 At a ceremony on Thursday 7 June, five outstanding students were awarded prizes, in recognition of their significant contributions to the year’s musical calendar at the University of Kent. This year’s Canterbury Festival Music Prize, awarded by Director of the Canterbury Festival, Rosie Turner, to a final-year student who has made an outstanding contribution to music at the University, was given to Chris Gray (Architecture); President of the Music Society this year, Chris has also played tuba with the University Orchestra, Concert Band and Brass Ensemble, and has also previously sung with the Chamber Choir and Chorus. In another guise, Chris also featured on the front of the Music Department Christmas card, complete with Santa outfit! The Colyer-Fergusson Music Prize, presented by chairman of the Colyer-Fergusson Charitable Trust, Jonathan Monckton, is given to a student who has made a major contribution to organising music at the University; the recipient this year was Masters student Adam Abo Henriksen, in particular for his role as musical director of the Musical Theatre Society’s production of Into the Woods which had a highly successful run at the Whitstable Playhouse in March (reviewed on the blog back in March here). The University Music Prize, for a student who has a made a major contribution to music during the year, was presented by Deputy Vice-Chancellor, Keith Mander, to second-year Economics student, Marina Ivanova; Marina is a member of the Chorus, Chamber Choir and Cecilian Choir, and this year performed in the Scholars’ Recital as part of the Canterbury Festival, as well as in the Scholars Lunchtime Concert as part of Summer Music earlier this term. She also stood in for the soprano soloist in rehearsals for Haydn’s Creation with the University Orchestra in the spring. The Awards Committee made two additional awards; the first, in recognition of his musical development at Kent, to second-year trumpeter Ben Lodge, who has been principal trumpet with the Orchestra, and played with the Concert Band and Big Band and the Brass Ensemble, for his exemplary approach and commitment to music at the University, and for a memorable opening to Mussorgsky’s Pictures at an Exhibition in the December orchestral concert. The second award, to a student who has made a significant impact on music-making in their first year, was awarded to saxophonist Tim Pickering (Forensic Chemistry); Tim has been quickly become a key member of the Big Band and Concert Band, and also participated in Jazz @ 5, as well as in Whitefriars with the ‘Big Brand New’ as part of the Sounds New Festival in Canterbury in May. Of course, there’s a vibrant mass of students who play a part in all the musical events in the University’s calendar with astonishing commitment and enthusiasm, and the Music Awards Committee has a difficult role to play in singling out particular individuals; the decision-making process is long and arduous, but an important one to allow the University to thank an especial few for their major role in everything musical over the year.